The New Sorbonne University (French: Université de la Sorbonne Nouvelle, also known as Paris III) is a public university in Paris, France. It is one of the inheritors of the faculty of humanities of the old University of Paris, which ceased to exist in 1970. Paris III offers courses in a wide range of Arts and Humanities subjects, areas in which - according to the 2018 QS World University Rankings - the university is the 71st best worldwide. The historic University of Paris first appeared in the second half of the 12th century, but was reorganised in 1970 as 13 autonomous universities after the student protests of the French May. Sorbonne Nouvelle, or "Paris III", is one of the inheritors of University of Paris faculty of humanities ("arts et lettres"). Entrance of the main building of the "new" Sorbonne university, built in by Henri-Paul Nénot, rue des Écoles, Paris. Asnières - located outside of Paris, where was housed the German Studies department is now closed. The Sorbonne Nouvelle has one central and five specialised libraries (Foreign language and culture and French literature). It is also connected to the Library of Saint Genevieve, the Central Sorbonne Library, the Inter-University Library for Oriental Languages and the Library of Saint Barbara. The Presses Sorbonne Nouvelle publishes research carried out by the university. The CROUS de Paris (Centre régional des œuvres universitaires et scolaires) is the organisation responsible for both student accommodation and refectories in Paris. 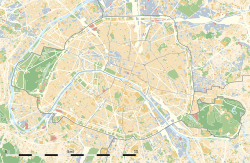 It runs various student halls of residence and student restaurants both in central Paris and in its outskirts. The Restaurant Universitaire Censier is the student refectory which is used by the large majority of Paris III students due to its proximity to the Censier university site. ^ a b Herpin, Fanny. "Université Sorbonne Nouvelle - Paris 3 - Les origines de la Sorbonne Nouvelle". www.univ-paris3.fr. ^ "Top Universities: Sorbonne Nouvelle Paris III". Top Universities.